The annual Cape Town Summer Surf Ski Series is here, and promises to be bigger and better than before. The 8 race series kicks off on 06 October 2013 offering 8 venues, lap races, long and short courses, for all to have fun on. This year the series is being organised by The Fish Hoek Surf Lifesaving Club, who will also be hosting and organising the Cape Town Downwind Race, and the Fenn Cape Point Challenge – known to all in the sport as one of the toughest and most hard-core 1 day surf ski race in the world. To enter for the series you need to visit Cape Town Surfski Series where you can enter for the series as a whole, or choose the individual races you would like to compete in. The website contains the full calendar and listing information. The series races cover a distance of between 5km – 7km for the shorter routes and between 10km – 14km for the longer routes. Clinics and training events will be held for local and international athletes. The Cape Town Downwind Race, an 18km race highlighting the beauty of the Cape Point and False Bay coastline, will be held on either the 15th or 16th December, depending on the weather. This race will include the world famous downwind Millers Run. The Fenn Cape Point Challenge will take place on the 21st of December and covers a gruelling 49km – a definite must race for every paddler’s bucket list. For more info please visit Cape Town Surfski or contact Nikki Mocke on 084 505 9581 or email capepointc@gmail.com. Follow us on @CTsurfski on Twitter and Cape Town Surfski on Facebook. Read on for details of each event – same contact details for each event – except Cape Point Challenge. Details included below. CAPE TOWN SUMMER SURF SKI SERIES RACE 1 FISH HOEK DUNLOP DUSTER: Race 1 of the Cape Town Summer Surf Ski Series kicks off on Sunday 06 October 2013 at Fish Hoek Beach, with the Fish Hoek Dunlop Duster. The event starts at 9am and offers a 5km and 10km route. CAPE TOWN SUMMER SURF SKI SERIES RACE 2 NATURALS HOUT BAY HUSTLE: Race 2 of the Cape Town Summer Surf Ski Series kicks off on Sunday 13 October 2013 at Hout Bay Beach, with the Naturals Hout Bay Hustle. The event starts at 9am and offers a 6km and 12km route. FENN CAPE POINT CHALLENGE QUALIFIER @ FISH HOEK BEACH 20 OCTOBER: The first of the Fenn Cape Point Challenge Qualifiers will take place on Sunday 20 October 2013 at Fish Hoek Beach. The event starts at 6am and covers a 35km course. CAPE TOWN SUMMER SURF SKI SERIES RACE 3 CIVVIO BLOUBERG BEAT DOWN: Race 3 of the Cape Town Summer Surf Ski Series kicks off on Sunday 27 October 2013 at Blouberg Beach, with the Civvio Blouberg Beatdown. The event starts at 9am and offers a 6km and 12km route. CAPE TOWN SUMMER SURF SKI SERIES RACE 4 SEAFORTH PADDLE: Race 4 of the Cape Town Summer Surf Ski Series kicks off on Sunday 03 November 2013 at Seaforth Beach, with the Seaforth Paddle. The event starts at 9am and offers a 7km and 14km route. FENN CAPE POINT CHALLENGE QUALIFIER @ FISH HOEK BEACH: The second of the Fenn Cape Point Challenge Qualifiers will take place on Sunday 10 November 2013 at Fish Hoek Beach. The event starts at 6am and covers a 35km course. CAPE TOWN SUMMER SURF SKI SERIES RACE 5 BEST 4 STRAND PADDLE BATTLE: Race 5 of the Cape Town Summer Surf Ski Series kicks off on Sunday 17 November 2013 at Strand Beach, with the Best 4 Strand Paddle Battle. The event starts at 9am and offers a 6km and 12km route. CAPE TOWN SUMMER SURF SKI SERIES RACE 6 NATURALS OCEANA TEST: Race 6 of the Cape Town Summer Surf Ski Series kicks off on Sunday 24 November 2013 at Oceana Beach, with the Naturals Oceana Test. The event starts at 9am and offers a 5km and 10km route. CAPE TOWN SUMMER SURF SKI SERIES RACE 7 NEW BALANCE SURFERS CHALLENGE: Race 7 of the Cape Town Summer Surf Ski Series kicks off on Sunday 01 December 2013 at Kommetjie Beach, with the New Balance Surfers Challenge. The event starts at 9am and offers a 5km and 10km route. FENN CAPE POINT CHALLENGE QUALIFIER @ FISH HOEK BEACH: The third of the Fenn Cape Point Challenge Qualifiers will take place on Sunday 07 December 2013 at Fish Hoek Beach. The event starts at 6am and covers a 35km course. CAPE TOWN SUMMER SURF SKI SERIES RACE 8 BUTLERS PIZZA PETER CREESE LIGHTHOUSE RACE: Race 8, the last race in the Cape Town Summer Surf Ski Series kicks off on Sunday 08 December 2013 at Fish Hoek Beach, with the Butlers Pizza Peter Creese Lighthouse Race. The event starts at 9am and offers a 5km and 10km route. 2013 CAPE TOWN DOWNWIND: The 2013 Cape Town Downwind Race will be held on either the 15th or 16th December – weather depending. The Start and Finish will be dependent on the wind that day, but the prize giving will be at the Fish Hoek Lifesaving Club. 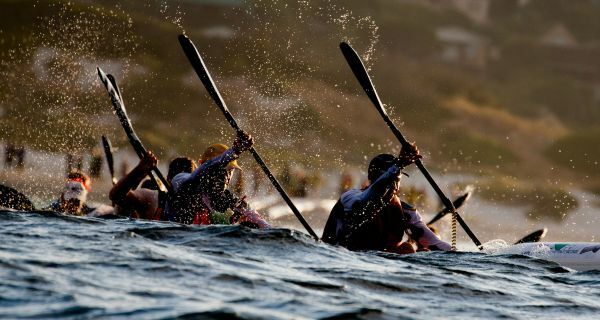 It is an 18km race including one of the World’s most famous downwind paddling runs – the famous Millers Run. Book Accommodation in Fish Hoek or surrounds for any of the above events! This entry was posted in Activity and tagged Cape Point Challenge, Cape Town, Cape town Surfksi Series, Surfski Series. Bookmark the permalink.